Mrs Storm had no idea what Mrs Wintle would have answered to that, but she knew her own feelings. What Rachel liked was an orange woollen frock, one of the dresses which Uncle Tom had designed for her. Over it she put on a brown coat. She did not wear a hat. Under her arm she carried her favourite book, The Wind in the Willows, which she knew from experience was wonderful for making time disappear. [The Wonders’] audition dresses had been designed to make the children look younger than they were, so it was not a kind dress to many of them. They were made of seersucker, very full without a waistline, with frills on the shoulder and round the bottom. I explained in two earlier entries why I thought this was such an unusual book, and why I liked it so much. It is much more cynical and cool than the whole of the recent Babbacombe’s, which was a book for adults supposedly. And there are few scenes in any of Noel S’s books to match the heart-breaking moment where Rachel is going for an audition, and her sister Hilary (they are unloved orphans) is trying to make her ‘look as if more trouble had been taken over her than any of the others’ even though Rachel doesn’t suit that blooming dress, and doesn’t come close to getting the part. Dulcie openly laughs at her, and it is a dreadful, painful moment. So, when Hilary slaps Dulcie, readers everywhere cheer loudly. This one seems like all the other Streatfeild books (they are now all published in Shoes titles, as if they were a real series) but actually it is very different. And excellent. 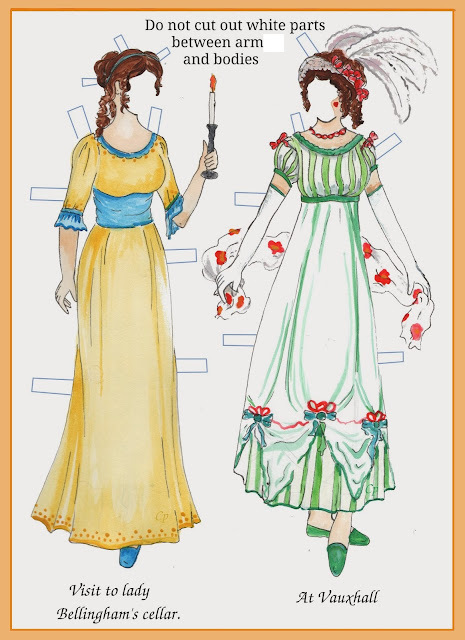 I think the top pictures are probably what the dress did look like, but they are not the pictures I had in my head when I first read it – and I was a child who would have looked particularly awful in the frills dress. I too could imagine a really wonderful plain dress that suited Rachel (and of course me) and I wish I could find the right picture – but it probably exists only in my head, and the heads of every other Wintle’s Wonders reader who knew she was Rachel inside. Another classic Streatfeild audition-clothes-panic here on the blog. And this audition blogpost had the helpfully descriptive title ‘Gasp at the Dodie Smith heroine in her Bo Peep outfit’, and an unmissable picture. I would have looked horrible in one of those dresses, too, Moira! What an interesting look at the whole audition process; that in itself got my attention. And it's refreshing in a way that the book doesn't seem too saccharine about childhood. That adds to its appeal, in my opinion. You're right Margot - it's not saccharine! funnily enough, Streatfeild seems to be more saccharine and conventional in her adult books. She has a clear eye for children and their lack of sentimentality, and the fact that they can be horrible to each other. I doubt if you'll believe this, but I am currently sewing the adult version of that vintage pattern--Butterick 4699. The Simplicity company has actually reissued a pattern from their archives of a 3-armhole wrap dress--8049. That IS amazing - and it is a nice dress! There's just been quite the discussion on Twitter about the post and the patterns - you would have won that conversation! I have worked out what the 3-armhole dress mean - intriguing structure. Just went and took a look at those two patterns online - fascinating, and a very very nice dress. But no fastenings at all...??!! I think I like the Butterick better. My goodness, what a trip down memory lane! That Butterick 4698 (or possibly an identical one made by Simplicity) was the first dress I ever made for myself. It was 1968 and I was 11 years old. It was a easy pattern for a beginner in one sense (since there are only the side seams and three shoulder seams), but every single edge is bound with bias tape, so there are yards and yards of it to be sewn on. Decades later I’m still not very good at sewing edge bindings on straight. 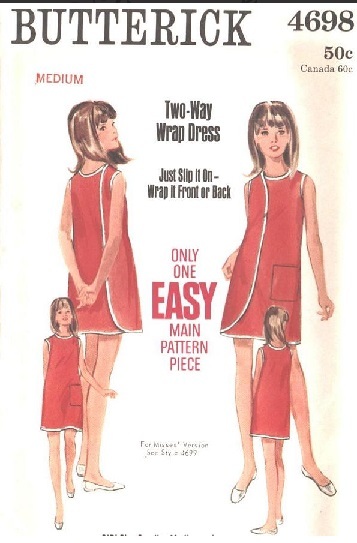 Gosh, those dress patterns took me back, I remember my Mum using them in the late '60s / early '70s. Do you know, I do see them and look at them, but ONLY in terms of getting pics for the blog, it never occurred to me for a second that one might actually use them as intended! Moira, I loved this post, but it took ages to read, because I went to the links, and they had other links, and I hunted for Ballet Shoes, and found photos of me when I did ballet. Never got as far as audition (not good enough! ), but for our weekly lessons we had very short royal blue tunics, with slits up the sides, and I seem to remember they wrapped around somehow, with ties at the back - not too dissimilar to your pattern perhaps. My mother made mine, along with the tutus we wore for pantos and summer shows - layers and layers of net attached to a satin bodice. Oh that's lovely, perfect Lucy. I am just reading Rumer Godden's Thursday's Children which someone reco'ed in one of these threads, and here's my picture! This does sound like a good book but I don't think I will try to fit it in. I love all these comments about the patterns. When I saw the Butterick pattern, I wondered what the vintage was because it looked familiar and I was doing a lot of sewing in the 70s. In my twenties, first marriage, Air Force wife. My mother and grandmother both made a lot of clothes from patterns too when I was growing up. I love the fact that so many readers enjoyed the patter pictures, and shared their memories of them. I couldn't sew at all myself, and really missed out I think.